Every time I join Miss Claudia’s classroom as a guest I tell myself I have to read and read more about the Montessori Method. I have to learn all that is behind those little people that go independently through the classroom and decide which lesson they’ll work on following their teacher instructions. How is it that that the little ones become so confident alongside their peers and so respectful of the older ones, and the older ones become leaders acting as examples who share with the younger ones the things they have learned before? Unique. 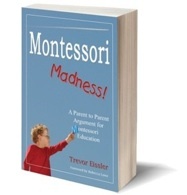 Recently I was introduced with Trevor Eissler’s book: Montessori Madness (http://bit.ly/I8d8IE). In his book Eissler, as a parent of three, describes how his family discovered Maria Montessori’s method and how they immediately fell in love with it. If you are considering a different learning approach for your kids, this book will give you wonderful insights to this fantastic world where kids are free to discover the adventure of learning at their own pace. If you are a “Montessori Parent” already, you will feel as if you wrote the book yourself. Eissler experiences and tales will remind you all the good reasons why you chose the best learning method for your child. If you have read the book, please share with us and our newer members what you think about it! In Sweet and Smart Montessori we look forward to listening to your own findings and opinions. Has this book helped you to understand the Montessori Method? Has it given you a better insight on how the Montessori Schools work?